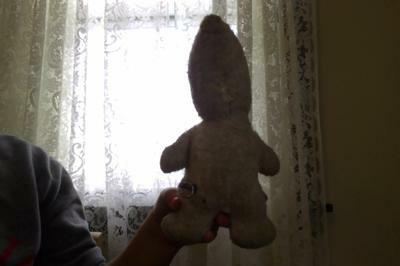 I was given this doll as a baby from my grandmother, who was known for her yard sale/ garage sale shopping. She's no longer with us to ask if she knew anything of the doll's information. I'm 30 (almost 31) years old, so time frame that's what i know. My mother said it was gently used when it was given to me. The doll is a wind-up music box type doll that still works and plays Beautiful Dreamer. I couldn't find my measuring tape to get the size but I'll keep looking in the interim. The face feels like a hard plastic and the material is pretty worn. Like a cotton/felt mix material. Hard to describe. I remember my mother cleaning it up very good years ago, and it was a white-ish color. There are no markings or tags to stamps. The lighting in the back ground causes the image to show up black.